You are here: Home / Games / What Do We Need From A Pokemon GO Update? What Do We Need From A Pokemon GO Update? 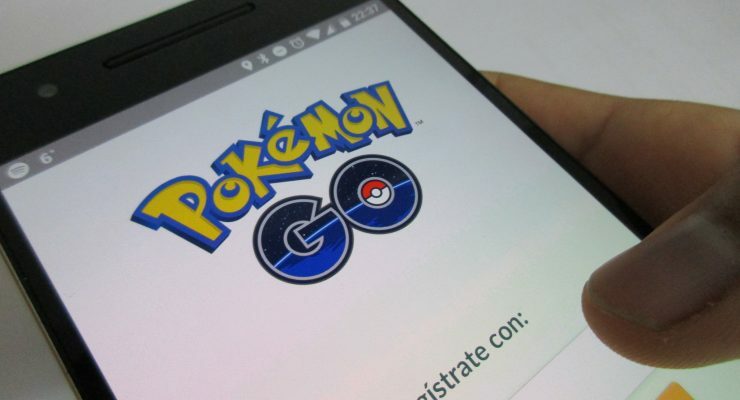 Pokemon GO has pretty much crashed the internet and while it’s the most popular app in history, we’ve kind of gotten our grips on the basics and we’re asking “what’s going to happen in the next Pokemon GO update?” There are a lot of glitches that the game needs to fix and a lot of basic features that need to get serious updates. The servers keep going down because everybody is playing it and the overcrowding has stopped Niantic, the company behind the game from unrolling it worldwide. 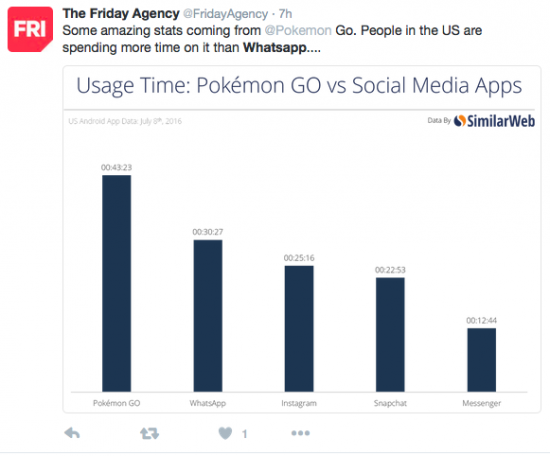 Check out this chart on app usage of Pokemon GO vs other apps. Here are a few features that I’d love to see in the next Pokemon GO update. John Hanke, Niantic’s CEO, has already stated that trading will be coming soon to the game. He imagines Pokemon GO as a way to meet new people and explore the world around them. Which is actually what the game is doing. I can’t count how many conversations I’ve had with complete strangers when we’re sitting across from each other in parks or stores that happen to be Pokestops. And if it’s like the original games, there are some creatures that can only be evolved via trading. Though my friends and I all joined Valor (the red team), I want to be able to battle against them and against players from other teams. If I’m taking the bus to work one day I’d love to be able to sit down and battle the cute girl sitting across from me or even the morbidly obese guy in the back. Everybody is playing this game so fighting other trainers is probably the feature I’m most looking forward to. Niantic has announced that they’re including a global leader board, which seems cool but what’s the point of that if we’re still isolated? There are claims that going near rivers and lakes will result in you finding more water-type Pokemon but I’m only half buying it. I live in the city and I’m only finding rats and birds and my friends at the beach are saying the same thing. I know this is a lot to ask but I’d love to see incredible location-themed Pokemon. If I’m passing the Nuclear power plant I’d love to see a gas-type. If I’m near the metro I’d love to encounter an Magnemite. Geogudes in the mountains, Grimer in the polluted Delaware River, you get the picture. Bernie Sanders getting a hearty mix of "Sellout," "Dad," and Pokemon Go tweets right now. This was one of my favorite parts of the old game and I hate that it’s not included in Pokemon GO. If I see a wild Pokemon I just have to catch it. There’s not really any way to train your Pokemon. You can take them to the gyms but that’s a hike for me. The reason I fought all those Pidgeys on my gameboy was to train my Pikachu. The gyms are decent, I’ll give them that. But I want gyms that offer a social aspect. Maybe a little forum. Gyms where I can actually train my Pokemon instead of just stagnant battles. I like that there aren’t “bosses” like there were in the old games but the gyms need a bit of work. The maps look just like Google Maps. And I understand that it’s tough to build an in-depth map but it still looks kind of cheap. For the most downloaded app in the world you’d expect something a bit cooler. I live close to the Washington Monument. Why isn’t that on my map as anything other than a blue dot? I don’t really know what I want here. It would be nice to train my Pokemon on my Macbook from my couch and I know that makes me sound lazy but they do need to be integrating across platforms. That means being able to play on your Apple Watch or on Google glass. This Pokemon GO update isn’t likely to come out soon but it could be great when it finally does. When I first got the game I chose Charmander thinking “heck yeah, soon I’ll have a big bad dragon”. I was wrong. I won’t have a Charizard for another few years because I need to encounter a bunch of Charmanders in the wild and so far I haven’t seen any of them. You level up with “candies” but what’s the point of that if I can’t ever get any candies? I’m not one of those players who’s big on the Pokedex. I don’t care about “catching them all”, rather I want to use them all in battles. I accepted within the first few minutes that I’m going to be spending actual, real world money on this game. But there’s not anything that I need to buy in the store. I can get Pokeballs at Pokestops. If Niantic wants me to drop some money on the app they need to let me buy the stuff that makes my Squirtle turn into a Blastoise. Right now the store doesn’t offer much appeal.